Marc Hochstein is the managing editor of CoinDesk. Nearly a year ago, at Consensus 2017, I bumped into blockchain lawyer Marco Santori, who made an interesting observation. The industry was in a transition phase, as the “blockchain not bitcoin” talk of 2015 and 2016 was getting old and cryptocurrencies were about to come back with a vengeance, fueled in part by the initial coin offering (ICO) boom. So, both the enterprise blockchain and crypto sectors of the industry were well represented among the crowd of 2,700 gathered in New York. But Santori remarked that neither camp seemed to be talking or interacting much with the other. They had essentially become two separate industries. And understandably so. The enterprises, particularly the regulated financial institutions among them, were afraid to touch bitcoin or anything like it with a 10-foot pole, given its past associations with dark markets and other illicit business. The crypto enthusiasts, for their part, were perhaps bitter about the condescending attitude that “blockchain 2.0” types had taken toward bitcoin, the very innovation they claimed inspired them. Early adopters who believed this technology could change the world for the better were also a bit underwhelmed by the enterprise crowd’s comparatively prosaic goals (e.g. making a bank’s back office operate more efficiently) – and skeptical that a “private blockchain” could even work. So perhaps the bifurcation was inevitable. But I suspect there might be just a little more cross-pollination at Consensus 2018 next month. Consider some of the stories on CoinDesk last week. First, an executive from the energy giant BP said it’s open to working with companies that have done ICOs and and that it might even consider using a public blockchain one day. The next day, executives from the insurance giant Allianz told CoinDesk’s Ian Allison about an internal token they’ve been developing to move money between its many global subsidiaries. Further, the Allianz executives were frank about their hope that it could one day reduce the company’s reliance on the legacy banking system – a faintly bitcoinesque aspiration. There have been other signs of a coming convergence, too. As CoinDesk reported earlier this month, Hyperledger, one of the big enterprise blockchain consortiums, has started opening its code to ICO projects. The Sovrin Foundation, a Hyperledger member that is developing a decentralized identity system, will be one of the first to raise money by launching a crypto token using the consortium’s code this summer. Perhaps the oddest mash-up of public and private is Hedera Hashgraph. Unveiled in March, it’s a public network with a cryptocurrency (though its consensus mechanism, Hashgraph, is different than a blockchain). But unlike bitcoin or Quorum or Hyperledger or zcash or R3’s Corda, Hashgraph isn’t open source. It’s patented by Swirlds, the enterprise software company that developed the technology. The benefit of this, according to the creators, is that the Hedera public network will be resistant to forks; if someone tried to clone it, the Hedera Hashgraph governing body promises to sue. Still, the code will be publicly reviewable, developers will be free to build applications on top of the network without a license, and anyone who wants to can set up a node. So it’s permissionless, up to a point. Even R3, a company whose name is almost synonymous with the concept of gated ledgers, is edging ever so gradually in the direction of openness. The consortium’s broadened vision for the Corda platform contemplates connecting a wide range of businesses (airlines, hotels, travel agents) across the globe, not just banks like its members. Richard Brown, the startup’s chief technology officer, describes the goal as “an open shared network – but still private, secured and permissioned.” Die-hard decentralists will scoff, but this sounds at least a tad more ambitious than the Wall Street-focused R3 of 2015. It’s early yet to declare a full-blown melding of the two worlds. But continued tiptoeing by enterprises toward the realm of public chains would support the idea that an open, global financial network is more useful than a balkanized one – just as the internet did more to create value than the corporate intranets that were in vogue in the1990s. In any event, if you come to Consensus 2018 next month wearing a suit, don’t be afraid to strike up a conversation with your hoodie-clad fellow attendees, and vice versa. You guys just might learn something from each other. 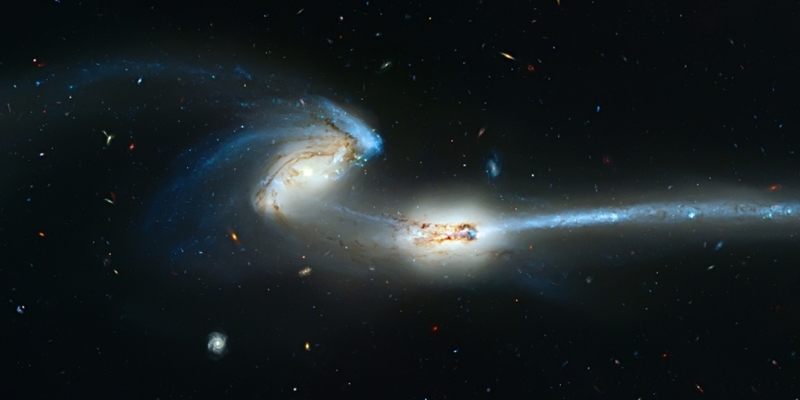 Colliding galaxies image via Shutterstock.